THOUGHTSKOTO Thoughtskoto : Robredo Hired Through Phone Call, Fired Through Text By Duterte? 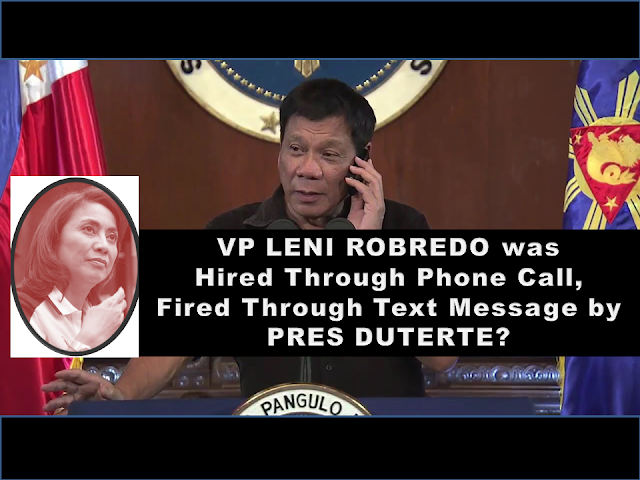 The Vice President, Leni Robredo was hired via phone call by President Duterte to become the Housing Secretary. And recently, a break-up text was sent to her to stop attending all Cabinet meetings in Malacanang. Soon after the SMS, Philippine Vice President Leni Robredo resigned from her post citing that the order will make it impossible for her to perform her duties. Cabinet Secretary Jun Evasco Jr’s text to Vice President Leni Robredo. Photo by Barry Gutierrez. "Good afternoon Madam Vice President. Mayor Rody Duterte thru Bong Go asked me to relay the message to you to desist from attending all Cabinet meeting starting December 5, 2 p.m. Thank you." We had hoped this day would not come. I had been warned of a plot to steal the Vice Presidency. I have chosen to ignore this and focus on the job at hand. But the events of recent days indicate that this plot is now being set into motion. From the very beginning, the President and I had major differences in principles and values. Since I assumed office, I have been consistent in my opposition to issues such as the burial of former President Ferdinand Marcos in the Libingan ng mga Bayani, extra-judicial killings, reinstating death penalty, lowering the age of criminal liability, and sexual attacks against women. But we both had a mandate to serve the people. I had hoped that this shared commitment to the poor and marginalized would transcend the differences between us. So, I took the job of Housing Secretary when it was offered to me. One, the budget for all key shelter agencies in 2017 has been slashed by more than P19 billion. Two, all our key shelter agency appointment recommendations have not been acted on. Three, the Executive Order designed to make HUDCC effective was not signed. This is the last straw, because it makes it impossible for me to perform my duties. Hence, I am tendering my resignation from the Cabinet on Monday, December 5, 2016. With this resignation, you can expect that I will continue to support the positive initiatives of this administration and oppose those that are inimical to the people’s interest. However, as your duly elected Vice President, I will not allow the Vice Presidency to be stolen. I will not allow the will of the people to be thwarted. I will continue to serve the Filipino family and fulfill their dream for a better life." According to the Vice President, there is a plot to steal the Vice Presidency from her. One, the budget for all key shelter agencies in 2017 has been slashed by more than P19 billion. Two, all our key shelter agency appointment recommendations have not been acted on. Three, the Executive Order designed to make HUDCC effective was not signed. 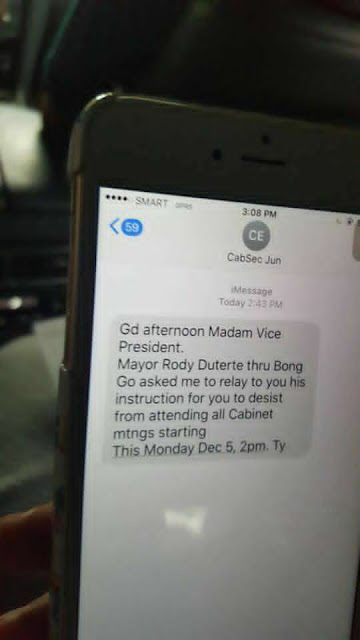 Then, we received a text message last Saturday from Cabinet Secretary Jun Evasco, Jr., relaying the President’s instruction through Bong Go for me “to desist from attending all Cabinet meetings starting this Monday, December 5... This is the last straw, because it makes it impossible for me to perform my duties"